ASUS N550JK-DS71T is an aluminium case and smart design, modern and elegant 15.6 inch FHD multi-touch display laptop with a 4th generation quad core i7 processor, 8GB memory, 1TB storage, offering great multimedia experience with the best of impressive visuals and crisper and louder surround sound (SonicMaster Premium, quad BangOlufsen speakers + subwoofer) combined, at a reasonable price. ASUS N550JK has a Haswell quad core Intel i7-4700HQ processor (6MB L3 cache) at 2.4GHz that can be overclocked up to 3.4GHz with the turbo boost 2.0 and the hyper threading function that allows the quad cores to handle 8 threads in parallel, 8GB of DDR3L SDRAM for multitasking, 1TB Serial ATA hard drive at 5400 rpm rotating speed as ample storage space to save lots of multimedia files and 32GB cloud based Asus WebStorage free of charge for three years. Asus Hybrid Engine II feature lets the system wake up from sleep in just 2 seconds. It comes with the Windows 8.1 operating system pre-installed with its new useful features, the familiar desktop Start screen (you can choose to boot to the Win 8.1 screen with tiles or the Win 7 start screen) and the Start button with two main functions (left click to the Start screen and right click to the Control Panel, Device Manager etc). You can use the mouse, touchscreen or the touchpad that also supports multiple gestures- tap, pinch-to-zoom, swipe, slide and drag to work comfortably on Windows 8.1 screen. 15.6 inch Active Matrix TFT Color LED backlit capacitive touch widescreen IPS display with 16:9 cinematic aspect ratio and up to 178 degree viewing angles with 1920x1080 native resolution and the integrated Intel Graphics 4600 + the NVIDIA GeForce GTX 850M graphics card, provides nicer picture quality with vivid colours and sharper texts, supports multiple touch gestures, uses less power thanks to the LED lamps. The upper mid-range discrete GTX 850M graphics with 2GB VRAM and DirectX 11.1 compatibility performs better than the GTX 765M and allows you to play some of the latest games like BioShock Infinite at the high settings but Crysis 3 or other similar very demanding games at lower settings, it offers better frame rates along with better performance. Sound is taken care of by the Asus SonicMaster technology, the integrated four Bang & Olufsen ICEpower speakers, the external plug-in mini subwoofer and the MaxxAudio tool that lets you customise the audio, so you have a winner here in terms of audio quality- realistic and cinematic true theatre-like surround sound. Connectivity options are the an integrated webcam, and microphone, SuperMulti DVD burner, Intel Dual-Band 802.11ac Wi-Fi that enables wider coverage and faster wireless connection, Bluetooth 4.0, 10/100/1000Mbps Gigabit Ethernet, a Multi-format media card reader supporting SD, MMC and SDXC formats, an HDMI port, a Mini DisplayPort, 3 x USB 3.0 ports, Headphone/Microphone Combo and 2 memory slots. 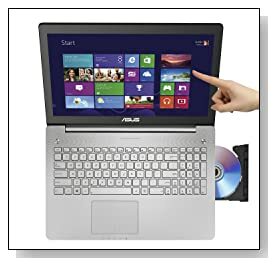 Silver grey aluminium body ASUS N550JK weighs 6 pounds and has the measurements of 17.30 x 10 x 1.10 inches- it is 1.1 inch at its thickest point. The chiclet style keyboard is backlit to let you type comfortably in dim lighting, keys that let you type faster with the reinforced springs and has 10-key numeric pad for easier number crunching. The lithium polymer battery gives you around 5 hours of battery life in average use. It works quietly and stays cool even after hours of working on the laptop with the larger vents, dual heat pipes and fans. It comes with a 12 month international warranty by Asus, including the Accidental Damage Protection. Conclusion: Modern with simplistic design ASUS N550JK-DS71T is a top of the range laptop with the best specs and features, including an Intel i7 processor with a Passmark Benchmark score of 7981, large amounts of hard drive and system memory (that can also be expanded up to 16GB max) to do several things simultaneously without experiencing the slightest delay, the best combination of audio and video (Full HD touch IPS display and SonicMaster Premium with quad speakers + subwoofer) for movies, songs, photos or games, much better graphics than previous generations with the NVIDIA GeForce GTX 850M discrete graphics card that lets you play most of the advanced games at medium to higher settings. What is missing here is a Solid State Drive for even better overall performance (which can be added later on) and faster boot-ups and the hard drive speed could be 7200rpm rather than the 5400rpm considering the class and quality of this computer. Otherwise it is almost perfect and offers awesome value for money. Highly recommended!